전접시란 접시의 테두리 부분이 수평으로 꺾여진 키가 낮은 접시를 말한다. 높이 1.9㎝, 아가리 지름 16㎝, 밑지름 9.1㎝ 크기의 이 접시는 전형적인 조선 초기의 전접시의 모습을 보이고 있으나, 특이하게 안 바닥 중앙에 작은 원이 얕게 패여 있어, 잔받침일 가능성이 있다. 이 원 안에는 ‘망우대’라는 글씨가 있고, 그 둘레에 간결하고 능숙한 필치로 들국화를 2포기 그렸으며, 위쪽에 꽃을 찾아 날아드는 벌을 그려 서정적인 느낌을 주고 있다. 전이 있는 가장자리에는 작은 원들이 장식되어 있고, 순백의 질이 좋은 바탕흙에 옅은 청색을 머금은 백자유약이 고루 퍼져 있다. 15세기 말에서 16세기 전반경 경기도 광주에서 만든 것으로 추정된다. 드물게 보는 깨끗하고 좋은 백자질과 조촐한 청화문양이 잘 어울리는 작품이다. This white porcelain dish has a horizontally bent edge. It has height of 1.9 cm, mouth diameter of 16 cm, and base diameter of 9.1 cm. 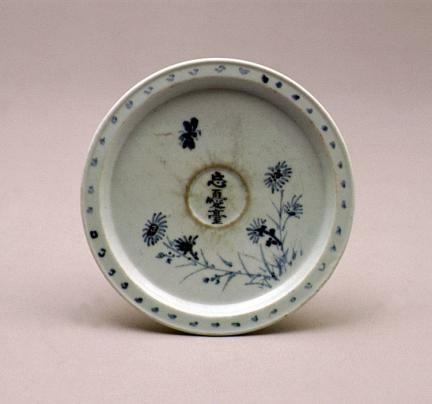 Although it displays the features of a typical dish dating back to the early Joseon Period, a small circle engraved shallowly at the center suggests that it might have been used as a saucer for wineglass. Written inside the circle is the word “mangudae” (literally meaning “a tower where one can get rid of anxiety”); it is surrounded by two wild chrysanthemums drawn with a neat, skillful touch. In addition, the drawing of a bee heading for the flowers creates a lyrical mood. The edge is decorated with small circles, and white porcelain glaze with blue tone is applied evenly on the pure white base clay of high quality. 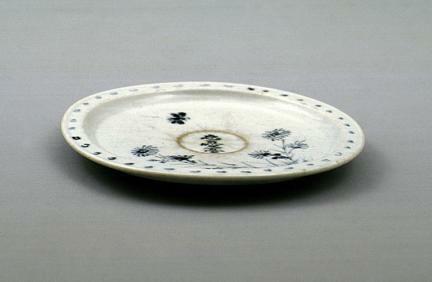 This dish was supposedly produced sometime between the end of the 15th century and the beginning of the 16th century in Gwangju, Gyeonggi-do. A rare piece of work, it shows very clean and high quality and poetic designs.